Regular posts will resume shortly. I've just been so busy lately! 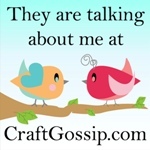 I have lots of fun goodies planned for the blog though. Do you guys like embroidery? And awesomeness? And...some other stuff? Remember Archie comics? I once had hundreds (yes, hundreds, true story), but now I have none. I gave them away in high school and have regretted it ever since. They probably weren't worth anything, but that's not really the point now, is it? 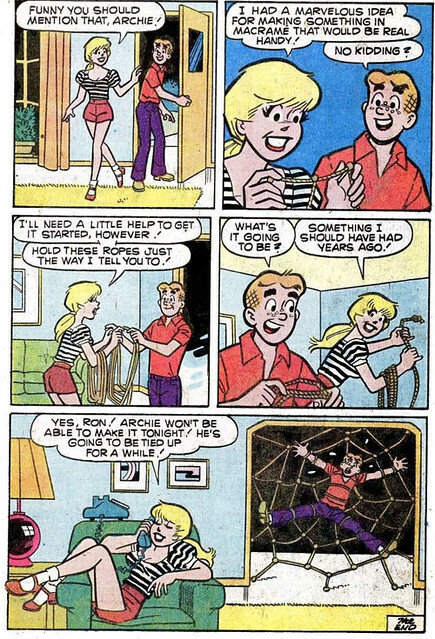 Anyway, I guess the Archie Universe got caught up in the 70s macramé fever too, because I distinctly remember a few story lines where the girls were making macramé things. 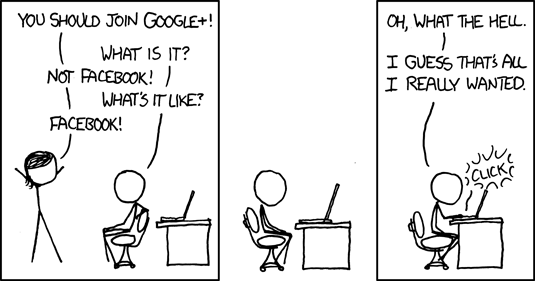 After many Google searches (and much cursing of my stupid decision to give all my comics away), this was the only one I found. I'm so jealous! 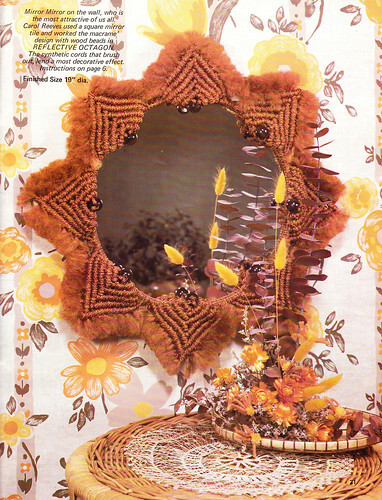 A whole room full of color-coordinated macramé projects! With three, count 'em, three different ways to hang your plants - from the ceiling, on the wall, and in the windows! And I do believe that's an owl on the project board. Here are a few of my favorite photos from my visit to the Birds of Prey Visitors Center last May. I can't believe that was over two months ago! 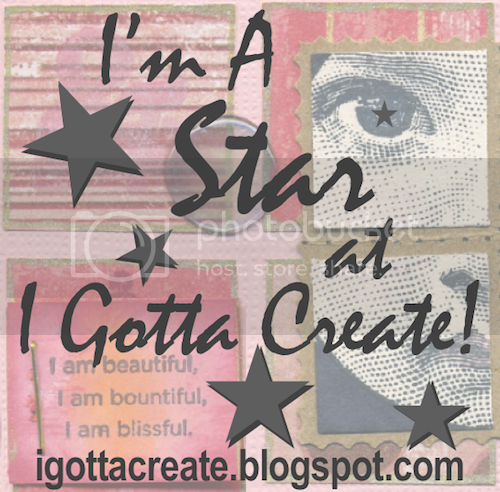 Time sure flies when you're procrastinating writing blog posts. All of the other birds either stayed towards the back of their cages or screamed at anyone who came too close. Not this cutie though! Phoenix hopped right up to the front and looked me in the eye. We had a lovely little chat. 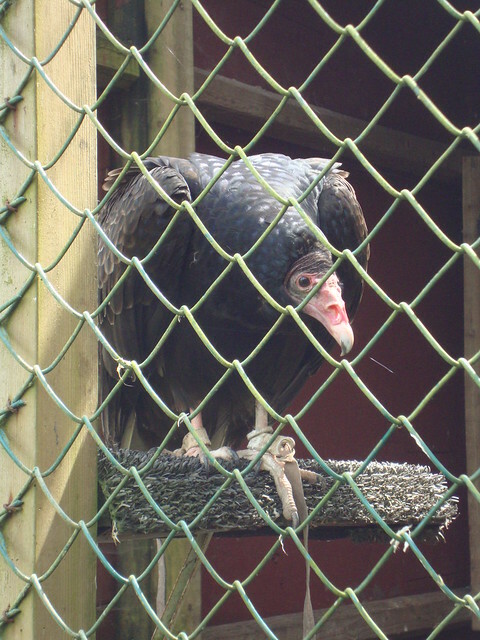 And there was another personable Turkey Vulture named Judge Dread who was in the flying demonstration. He was a cranky boy, and flew up into the trees refusing to come back down. He was still ignoring the handlers an hour later when we left. This is why Turkey Vultures are awesome. Not much to say about the hawks. They were hopping and fluttering about on their perches, twisting their heads around to get a good look at us. Later on, one managed to get off his tether somehow, and swooped down during the Barn Owl's flying demonstration. He obeyed the handlers though, and was caught before he could catch his snack. Needless to say, poor Cleo was pretty spooked after that. 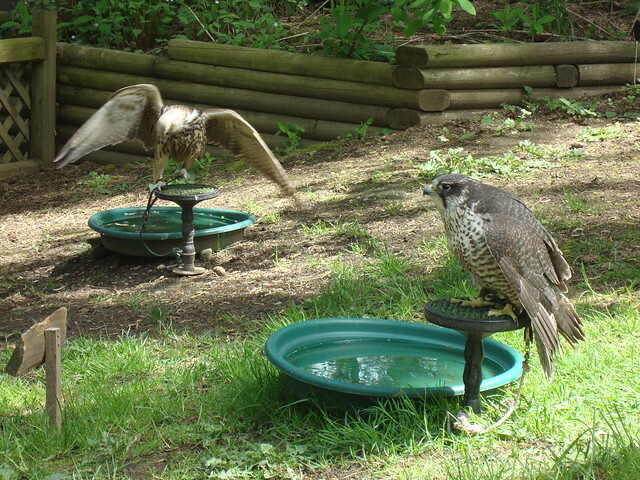 There were falcons galore! It's pretty creepy when they're all sitting quietly, staring at you, most likely plotting your demise. It reminded me of that scene in The Birds where the blonde lady is sitting outside the schoolhouse. It's super quiet, and after a couple minutes she turns around and realizes that the jungle gym has completely filled up with birds while she had been sitting there. 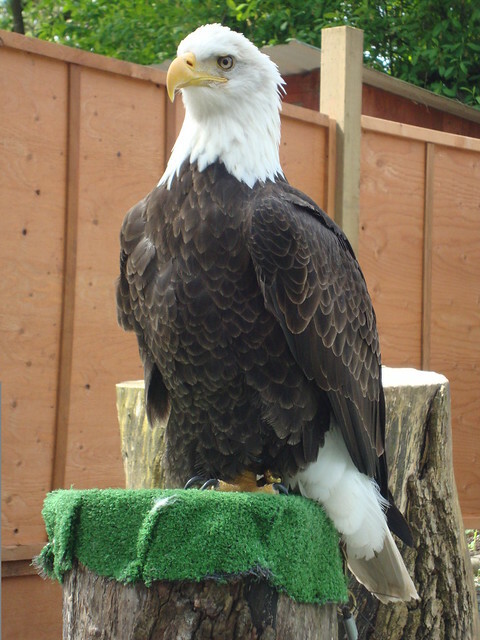 The eagles were absolutely beautiful! They looked so soft and fluffy and I wanted to hug them. I didn't though. I rather like having all of my fingers, thankyouverymuch. Besides, Manwe probably had fishy breath. 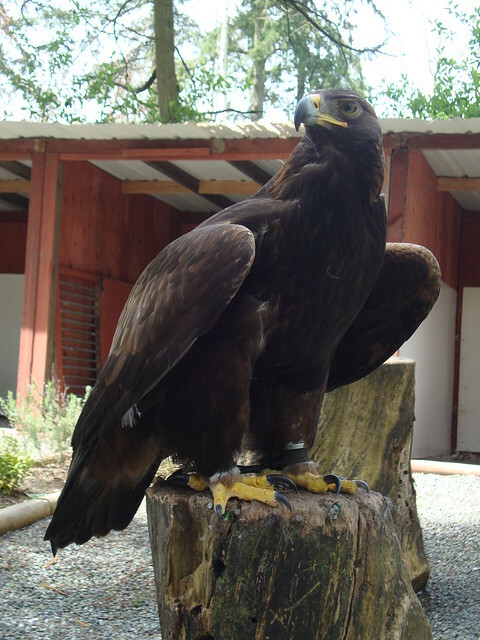 Anakin the Harris Hawk on my arm! Yay! 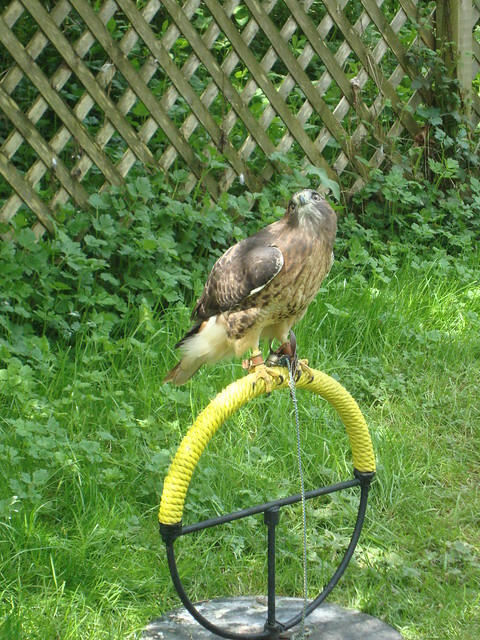 This is the lucky hawk that I got to play with on the Hawk Walk. 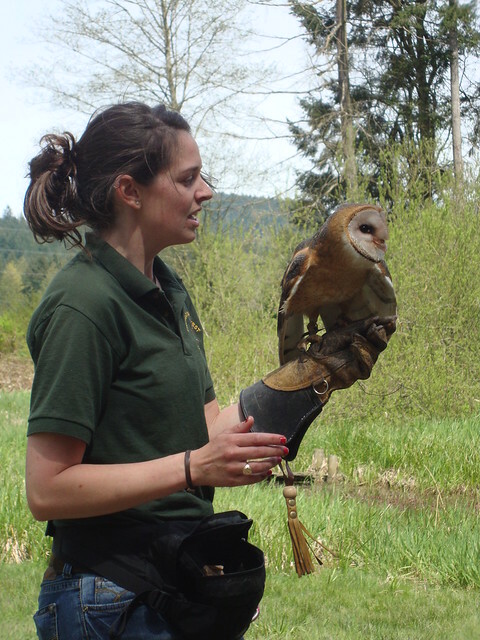 You get to wear one of those big fancy gloves and go for a short stroll through the woods with a hawk and a handler. 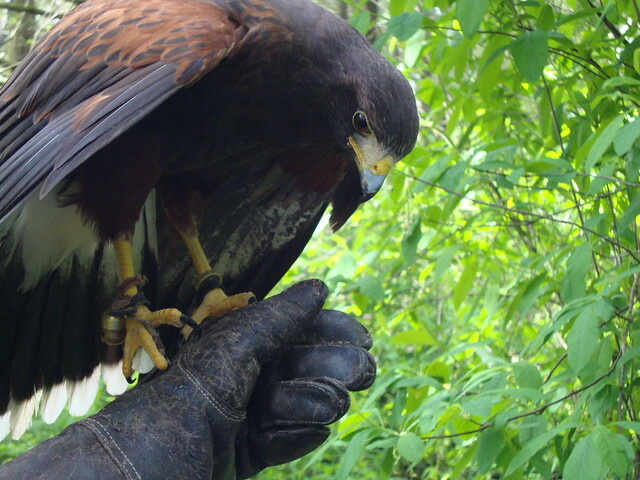 The hawk flies overhead and lands on your arm to eat the bits of food that the handler puts there, flying away again as soon as he's done. I did get to walk the last few minutes with Anakin tied to my glove, though he wasn't especially happy about it. In fact he seemed downright indignant. I, however, was thrilled! 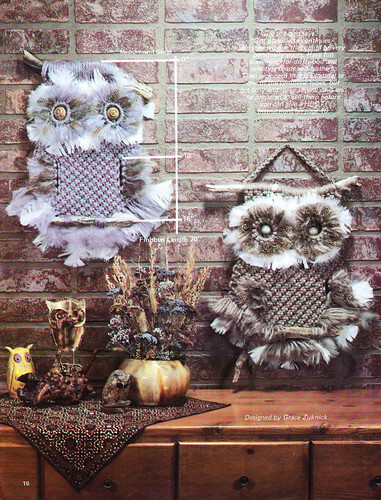 I think it's high time for another dose of macramé owls, don't you? 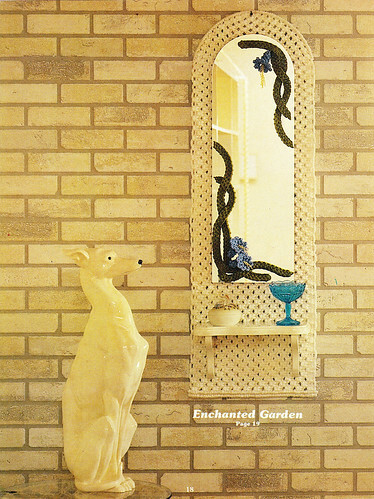 After all, they're probably the first thing that comes to mind when you think of macramé. Well, owls or plant hangers, I suppose. Or maybe jewelry. Purses? Well, it's definitely not speaker tables or belts for shy hot pants wearers anyway. And how about that little owl grouping on the table? I especially like the little metal one in the middle. I'd love to find a few metal owls to add to my collection. Perhaps even a few 80s hair metal owls with teased long hair, leather pants and the obligatory power ballad. "Wise old bird says..."popularity level continues." We selected one that could be very personally yours. Have fun scavenging for driftwood and collecting beads and feathers. 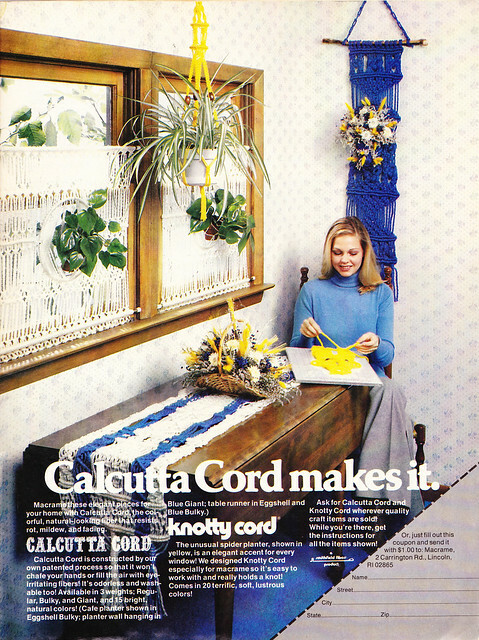 Then pick cord that is a natural or one of the synthetic types, but get busy and make several owls and be prepared to sell them before you can give a HOOT!" Well, what are you waiting for? 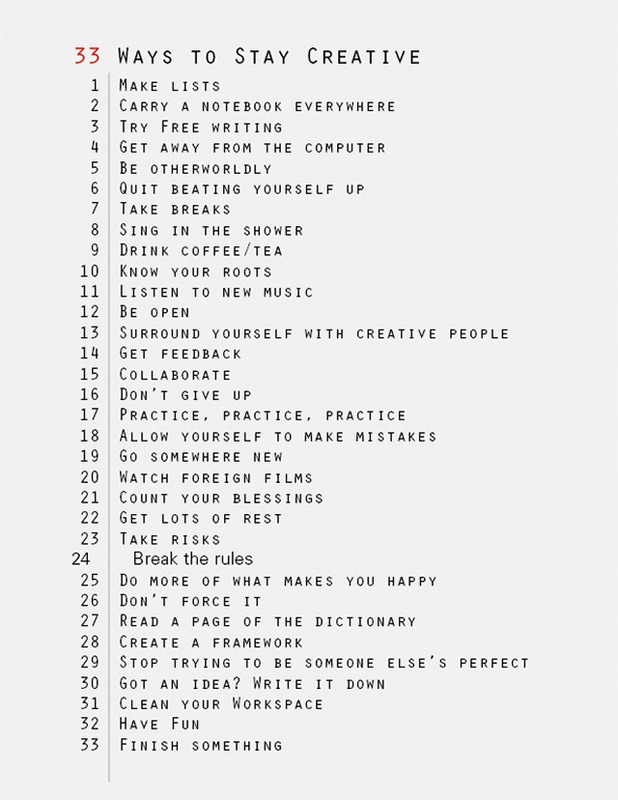 Get busy and make several owls! Come on, tell the truth. Would you have passed this up? Of course you wouldn't! It's all kinds of awesome! 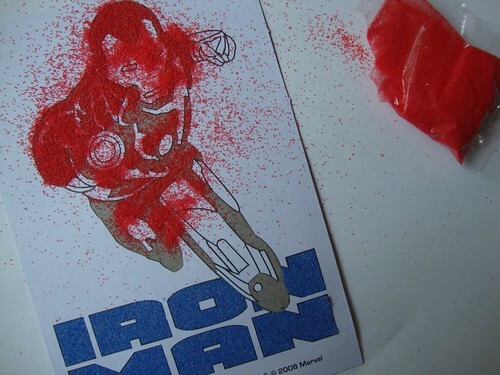 I'd really like to know who's idea it was to combine the latest incarnation of Iron Man with a retro kitschy craft like sand art. I want to be their friend. 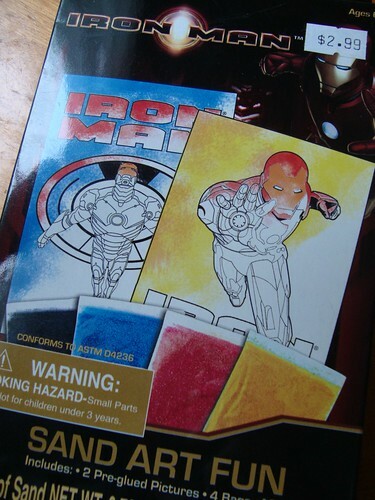 This isn't really a tutorial or even a review of the Iron Man Sand Art Fun (yes, you have to say the whole thing). It's just something I did recently that amused me greatly (it usually doesn't take much). I probably would have done a sand art tutorial, if the very awesome Jennifer of Naughty Secretary Club hadn't beat me to it. Sand is messy. 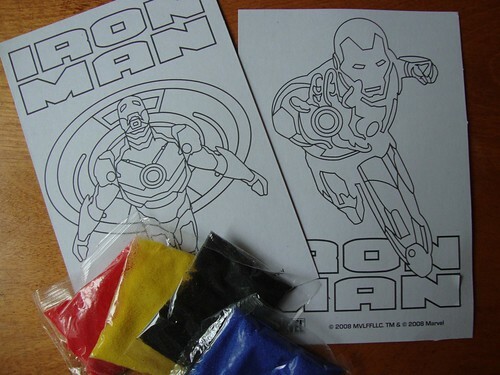 If you feel like making some sand art of your very own, Iron Man or otherwise, make sure you have a big piece of paper beneath your masterpiece. You have to pour the excess sand off, and it's a lot easier to dump it on the paper, and use that as a funnel to get it back into it's container. Or, you can just leave it there like I did. 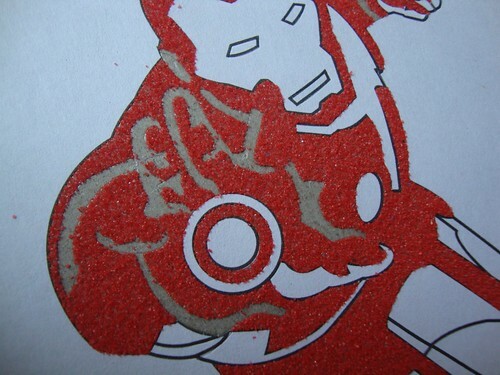 My only complaint with the Iron Man Sand Art Fun is that there really weren't any outlines to fill in. That is what the black sand was included for, right? This was the best I could do, short of busting out the exacto knife and making my own outlines. My fingertips were quite happy that I didn't attempt that. 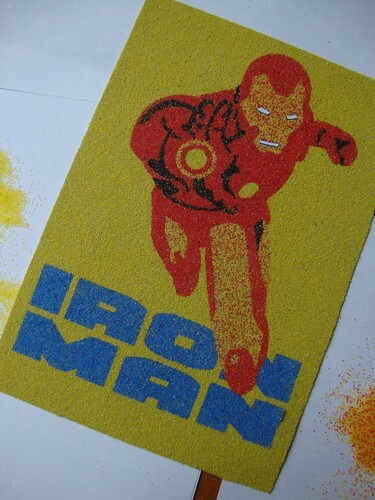 And there you go, one completed Iron Man Sand Art Fun! 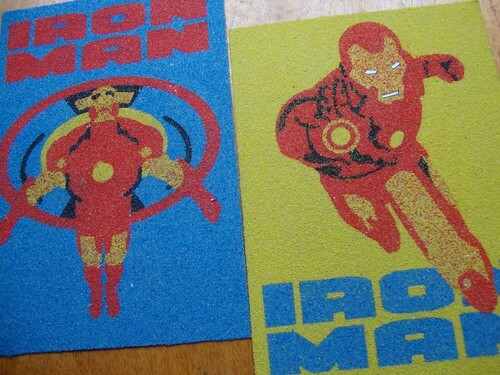 I assumed mixing the red and yellow sand would make an orangey looking sand, but no, not really. Oh well. I left his eyes and mouth white on purpose, though in retrospect, I probably should have made the mouth black. 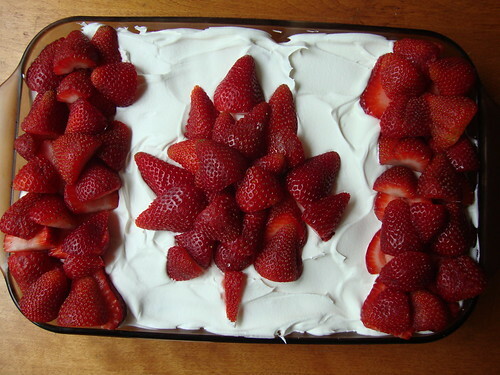 Ooh, pretty! 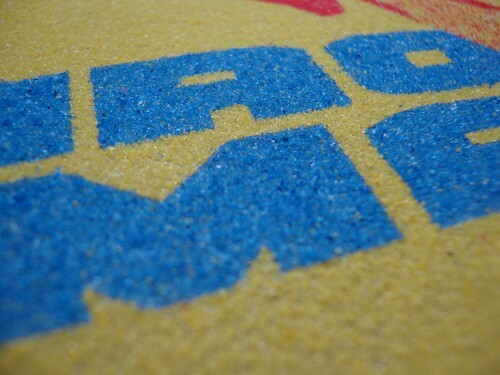 I'll probably pick up some colored sand to play with later on, 'cause this was actually kinda fun! OMG you guys! Animated Space Invaders cross stitch! Check this out for more laser love!